Landlords now have just a year to meet a new energy-friendly target for the properties they rent – or face a restriction on granting new tenancies. 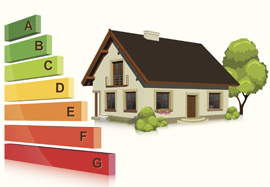 In 2016, the government declared that all tenanted properties must achieve a minimum of an E rating in their Energy Performance Certificate (EPC). Landlords whose buildings fail to reach this standard by April 2018 will no longer be able to offer a tenancy to either new or existing tenants. Those who let properties with an EPC rating below or close to the required rating must ensure works are carried out to bring their homes up to scratch in the next 12 months. Allison Thompson, managing director at property specialist Leaders, says: “Failure to achieve a minimum of an E rating will leave landlords unable to let a property to a new tenant, while some recent legal updates have suggested they could also be prevented from renewing an existing tenancy. “As the deadline gets even closer, we expect tradespeople capable of carrying out eco-friendly home improvements to be in extremely high demand, so landlords would be wise to have work carried out sooner rather than later. Thousands of older properties across the UK – particularly those that date back to the Edwardian and Victorian periods – are expected to fail to reach an E rating, making green improvements a must. Leaders is able to offer support to landlords looking to make eco-friendly home improvements in order to meet the new regulations and can recommend qualified and experienced contractors to carry out work.